Rep. Ilhan Omar is having a really rough day. The Minnesota Congresswoman found out her take on the 9/11 attacks, saying that “some people did something,” just got utterly destroyed. The 37-year-old Omar really freaked out as she was blasted with: “Here’s your something,” which straightened her out about the 3,000 Americans killed by terrorists. Her reaction to the truth is priceless. You’ll love this. Rep. Omar, the highly controversial Congresswoman, started out her day announcing her new bill to eliminate “Trump’s hateful Muslim ban.” Little did the arrogant 37-year-old know that her day would take a turn for the worse when the New York Post devoted their entire front page to shame and chastise her. 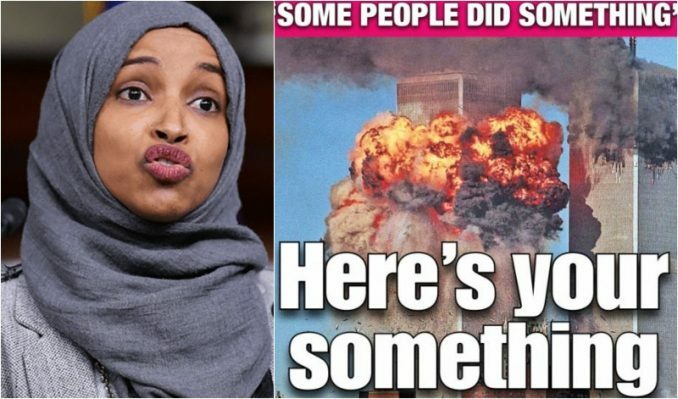 “The New York Post’s front cover Thursday gave a blunt response to Democratic Minnesota Rep. Ilhan Omar’s characterization of the Sept. 11, 2001, terrorist attacks as ‘some people’ who ‘did something,’” the Daily Caller reports. The headline in large white font reads, “Here’s Your Something,” coupled with an image of the World Trade Center being hit by a plane in the background. Omar delivered a speech March 23 — surfacing on Twitter just this week — at a Council on American-Islamic Relations (CAIR) fundraiser event, where she used non-specific terms to describe the 9/11 terrorist attacks: “Some people did something.” She seemed to be trying to make the case to a majority-Muslim audience that the attacks didn’t warrant restricted “access” to the “civil liberties” of Muslims. “CAIR was founded after 9/11, because they recognize that some people did something and that all of us were starting to lose access to our civil liberties,” Omar said in her speech. 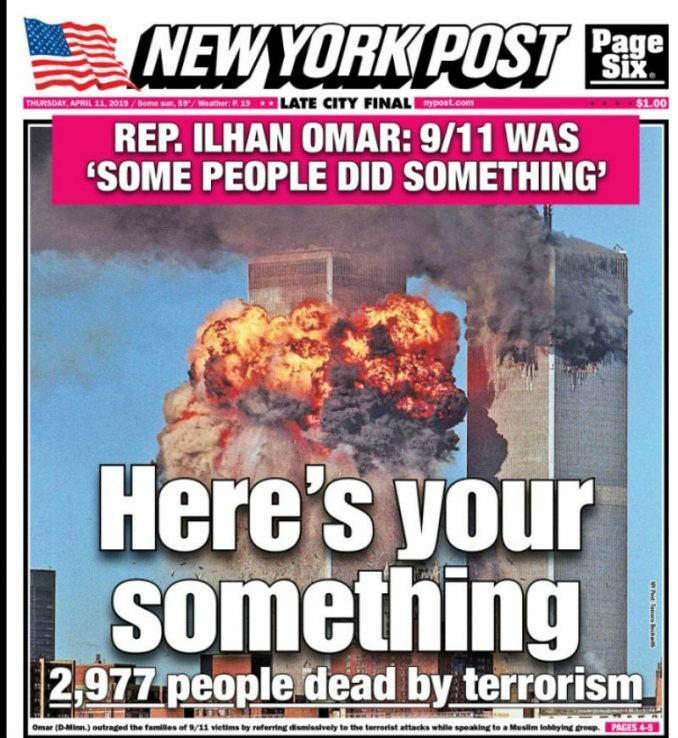 The New York Post was making a clear gesture against Omar’s comment in their Thursday, April 11 cover, with a subtitle reading “2,977 people dead by terrorism.” But that’s not all. The disgraced Congresswoman’s reaction was priceless. Instead of apologizing to the country and to the 9/11 families who lost loved ones, the rabid Trump-hater doubled down and played the victim card. You see, for Omar, this is an unwarranted attack on her and the New York Post is causing white nationalists to plot death threats against her. Maybe she should be pointing her finger at herself. Omar is the one making reckless statements about 9/11 besides her history of anti-Semitic remarks, and then she calls those who rightly react and remind her of the facts about 9/11 the reckless ones? You just can’t make this stuff up. It was Omar herself who started blaming others for death threats even before The Post’s front page lambasted her. “Rep. Ilhan Omar, D-Minn., cited death threats as a reason she shouldn’t be criticized for her dismissive remarks about the Sept. 11 terrorist attacks, rebuking a tweet from a fellow GOP lawmaker,” the Washington Examiner reported. Americans were weighing in on Omar and the New York Post, setting the Somali immigrant straight. “Actually the cover falls a bit short when telling the true story. Much better headline: “2,977 people dead by 19 Muslim terrorists”. Let’s not lose the underlying culprit… radical Islam,” tweeted Dennis Michael Lynch. “‘Some people did something’ wrong by voting her into office. She is against everything our nation stands for…..period! #IlhanOmarResign,” tweeted Will Alexander. We know she will never resign. Omar must be recalled and replaced by the good citizens of Minnesota. In 2003, Californians gathered enough signatures to call for a special election. The result was Democratic Gov. Gray Davis was recalled in the middle of his term and he was replaced with GOP Gov. Arnold Schwarzenegger. This is the only way to get rid of Omar. Remember, the disgraced Congresswoman started her day by announcing her big bill to eliminate “Trump’s hateful Muslim ban.” It’s worth noting that Omar is once again peddling a conspiracy theory and trying to cause hatred against the president. It was never a “Muslim ban.” Sure, it affects a few Muslim-majority countries, but it also affects other regions of the world which are not Muslim-majority. What the Minnesota Congresswoman accomplishes is sowing hatred and division in this country that she clearly hates. Omar’s goal is to transform America into a third-world Socialistic state. Enough is enough, it’s high time she was recalled and replaced by a true American patriot.